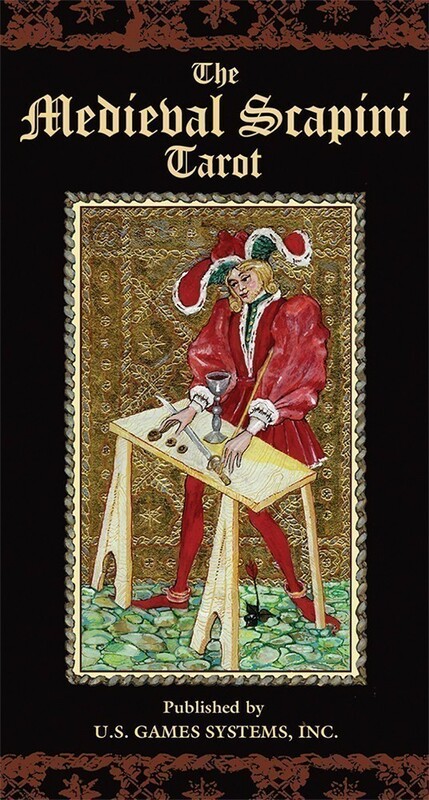 Medieval Scapini combines the traditional trumps of the early Italian style tarot with the more modern system of illustrating the pips, all in incredibly detailed artwork. While this is a contemporary deck, one would think it had been delivered in a time machine from the renaissance! I personally find the trumps to be the real anchor in the deck. What this means is that this deck is one you will perhaps need to grow with. But I find this deck to be worth the time and effort to study the LWB and the multitude of details on each card. This will broaden your interpretive possibilities for each card. 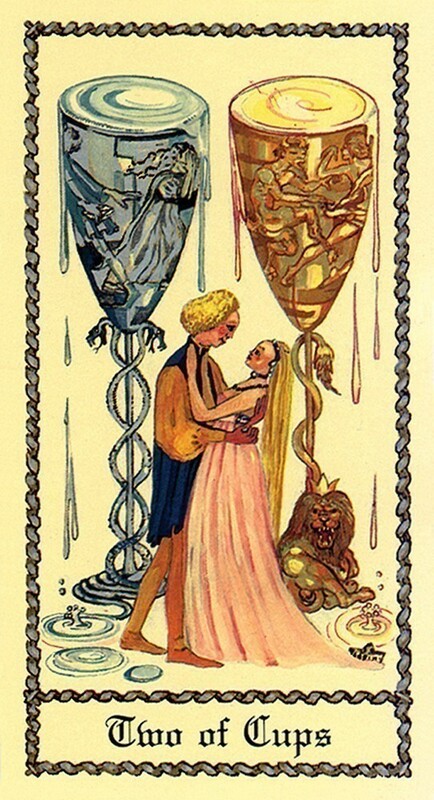 One thing I was delighted to see was that many traditional cartomancy meanings can be found in some of the smaller images on the cards that are not normally part of a tarot card's vocabulary. For playing card readers, this would be quite a nice deck for making a transition to tarot. For example, the Ace of hearts in playing cards is often given the association of the home, home and family, the source of one's support, in addition to the standard Ace of Cups meanings. 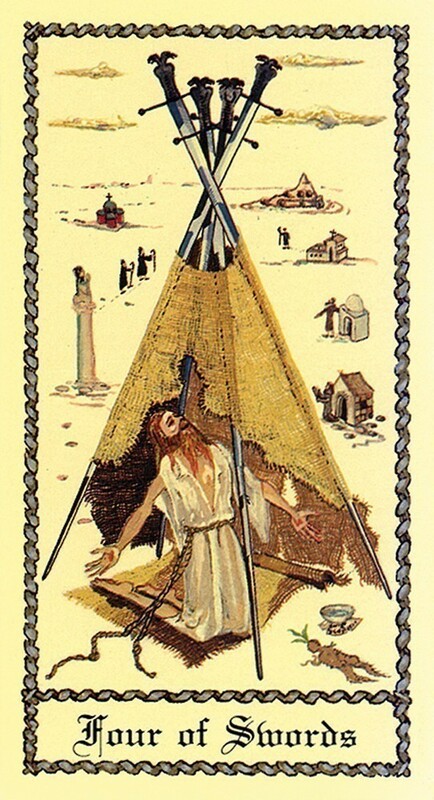 In this deck the Ace of Cups contain a cluster of box-shaped objects at the base of the fountain, which look like a small community of houses or homes, thus permitting an easy adaptation to an extended meaning for me in my readings. 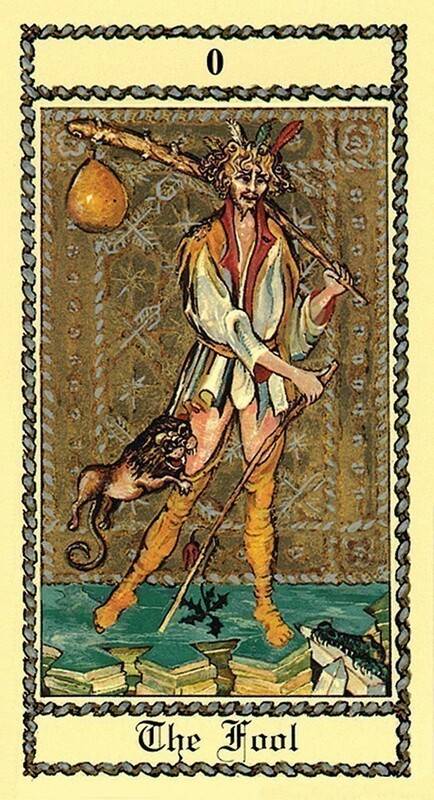 Another such example is the 10 of Wands (clubs). 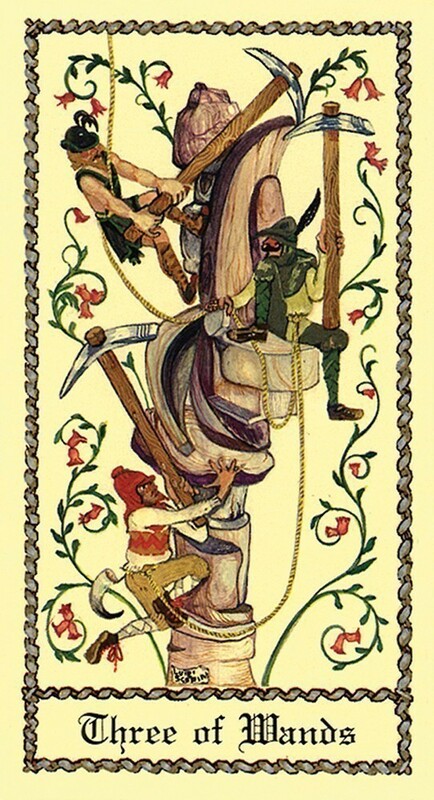 This card depicts a winding path along which two men lead beasts of burden charged with a heavy load. Various men wait on the side of the road watching, spying. 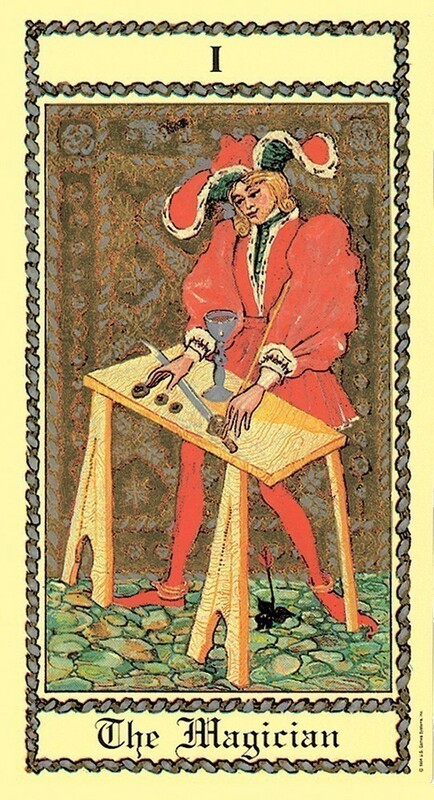 In cartomancy, the 10 of clubs can also denote travel, business travel, or even owning your own business. This card easily absorbs these meanings. Yes, this is a very busy deck. Yet this also gives the reader a choice. The abundant details can be studied meticulously, or if that is too much for you, you can simply find the dominant image to give the card its overall flavor and let the rest be atmospheric -- which is what I do with this deck. 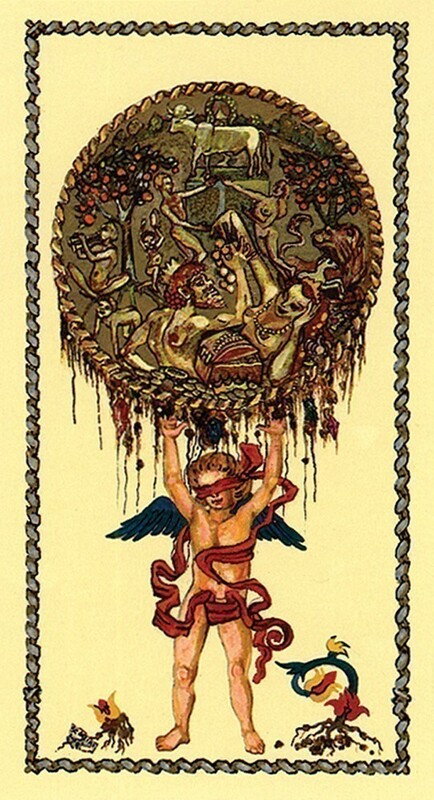 Medieval Scapini Tarot has a special place in my heart. This deck speaks to me more than any other deck I've ever come in contact with, especially the artwork. The pictures have so many intricate details, that they are easy to read. Look at these cups. Each container has it's own story to tell. And I love that the cups aren't just goblets, these cards are filled with any kind of medieval vessel. On the coins, each coin has a different and unique image. The three of coins has a happy man playing a tambourine on one, Caesar on another and Venus on the third lined up next to a statue of a man who reminds me of da Vinci. This deck is about a time in Western history that is still held dear today (Renaissance festival anyone? ), has detailed images that are full of color, fun and are sometimes very serious. 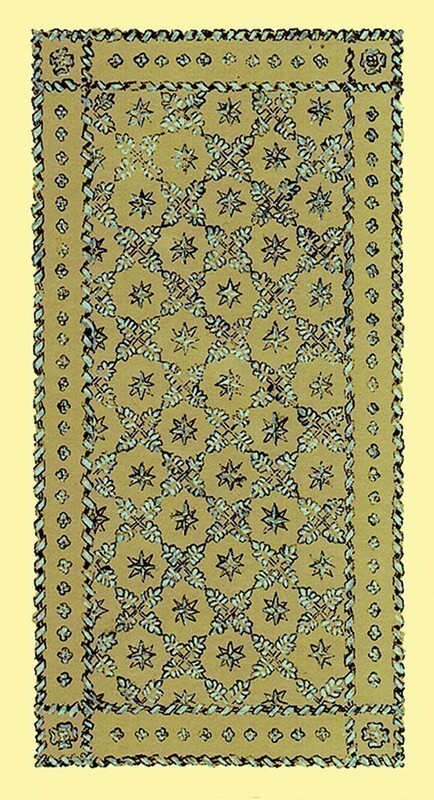 They have gold inlays and are printed on light-weight cardstock in Italy.